Join Endurance - A Sports and Psychology Center for a Kenyan adventure – train in the US (or your home country) and travel to Kenya for an international half marathon (Safaricom or Nairobi Marathon) and then relax on a guided sightseeing tour of Kenya! Kenyans run just like you – one step at a time – see for yourself! 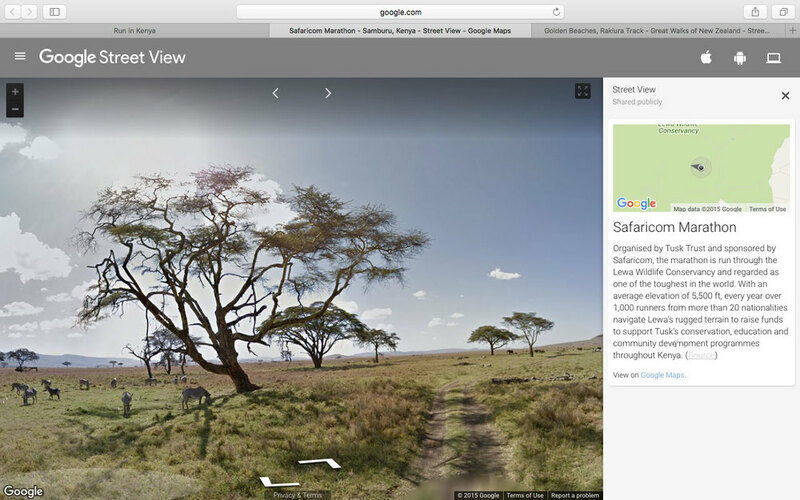 Click here or the image below to see a Google "street view" of the Safaricom Marathon course. Have you dreamt of running a marathon or half marathon in Kenya? Do you enjoy meeting and talking to local people and learning what it’s actually like to live in another country? Do you want to step off the tour bus for a more authentic travel experience? Join us for our information sessions or contact us. Are you ready for a Kenyan tour and running adventure? Bring your small group - family, team or co-wokers on a 14-day adventure of a lifetime! Visit our favorite places in Kenya and participate in a Half-Marathon benefiting Tusk.org and the Lewa Wildlife Reserve or Standard Chartered's Seeing is Believing Initiative! If you would like to go to Kenya at a different time, please contact us. Copyright © 2016, Endurance - A Sports and Psychology Center, Inc. All rights reserved. At the end of the trip, you are free to stay longer. You will have real fun in the bustling city of Nairobi, in the nearby National parks, the luxurious white sands of the Indian Ocean or the running capital of Kenya, Iten. Contact us to reserve your spot and for the current pricing and itinerary. Before you leave: You can train with our Kimbia - Half-marathon training program. Dr. Nyamora will help you formulate personalized goals and help you build up your endurance no matter what your current fitness level. We will also provide an orientation to Kenya including a brief political history, a few key Swahili phrases, and other important tips on making the most out of your adventure. You may also wish to read books & articles or watch films from our list of recommended resources. While you’re there: In Nairobi, you will stay in a hotel, lodge or house and enjoy home-cooked meals. We will spend several days getting acclimated and recovering from jet lag, while also doing some light tours of Nairobi. You will run the marathon in a beautiful game reserve (In June) or the wonderful city of Nairobi (In October), spend a day recovering, and then either travel to Kenya’s Indian Ocean coast for a few days of luxury relaxation at one of our favorite resort hotels, or travel to Iten, the running capital where you will stay in a runners training camp. You’ll return to Nairobi for one more day before flying back home. When you return: We will meet one more time to share photos and celebrate our adventure. You’ll already be looking forward to your next trip!